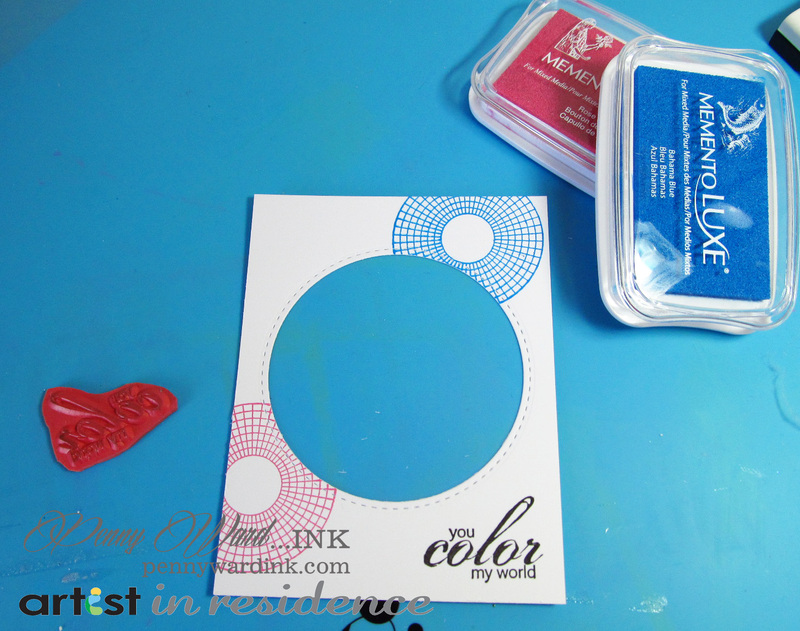 Imagine Crafts/Tsukineko: Inks; Versafine Onyx Black, Memento Luxe Bahama Blue & Rose Bud. irRESISTible Spray Danube Blue & Lilac Posies. Memento Markers Dandelion, Love Letter, Danube Blue, Lilac Posies, Cottage Ivy & Grape Jelly. 1) Make a base card from white card stock to measure 5.5 x 4.25 when folded. Set aside. 2) Cut white card stock same size as base card. Die cut next to largest circle in the center. Stamp small color wheel with Bahama Blue and Rose Bud. Stamp sentiment as shown with Versafine Black Onyx. 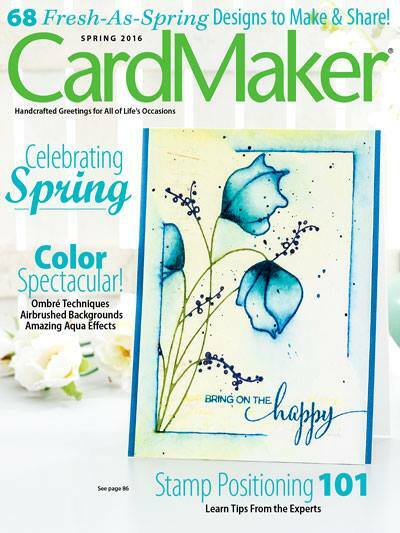 Using irRESISTible, flick spots of color across the card front. Adhere Clear card stock to back of opening. Set aside. 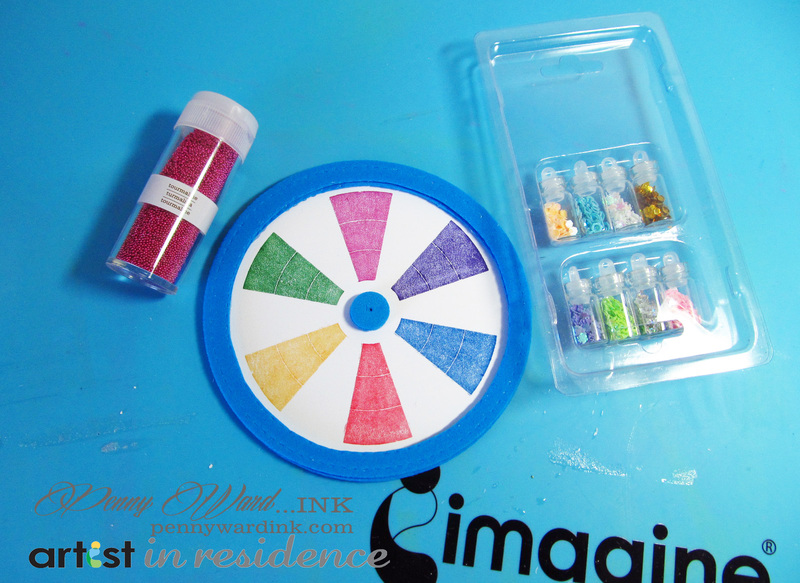 3) Apply Memento markers to color wheel stamp (I colored every other). Stamp onto white card stock. Die cut with largest circle die. 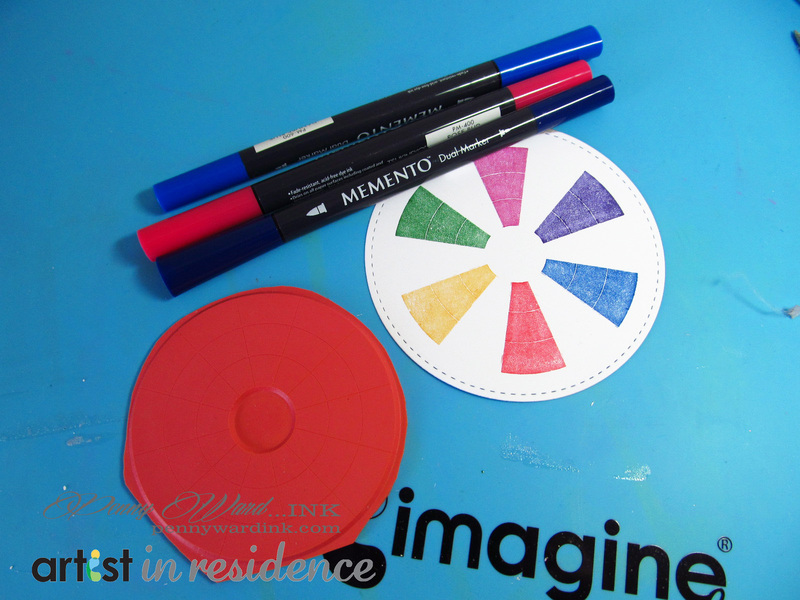 4) Die cut foam craft sheet two times with the large circle die, trim and adhere to stamped color wheel. Die cut two small circles for the center section. Add glass beads, sequins, buttons etc. to center area. Apply glue onto the foam ring and adhere card front. Attach brad to center of shaker panel. 5) Apply foam adhesive to the back of the shaker panel and adhere to card base. Leave a comment to enter the GIVEAWAY! Now onto Maureen's Blog for more goodness!!! What a fun card. 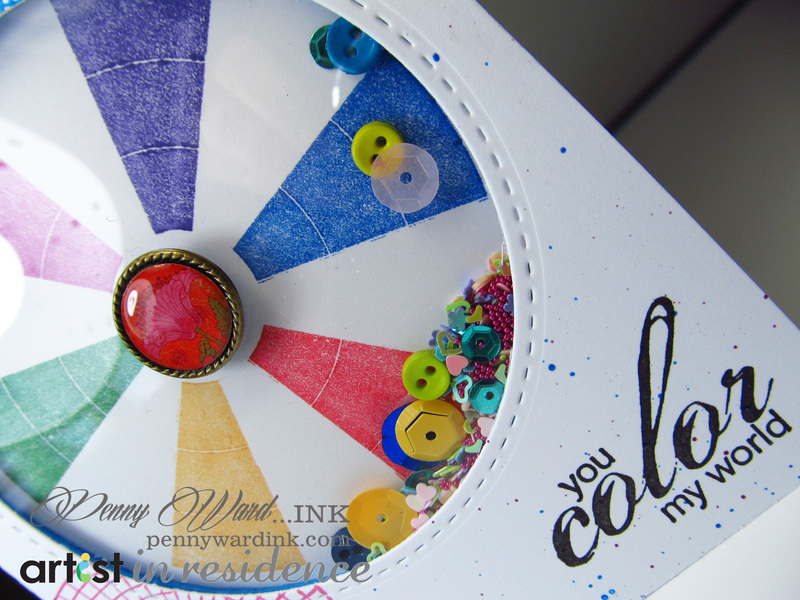 I love the color wheel idea, and it is so very colorful for a birthday card, or just because. I love shaker cards...the kid in me I guess. You did a fantastic job. Perfect colors. That is such a fun card!! I love it! Thanks for sharing! Fun shaker! Love all of the color!! What a wonderful colorful shaker card. A perfect use for those tiny colorful buttons! Oh my goodness - I am in love with this shaker card!! SO well done and Love the message!! LOVE, LOVE, LOVE your shaker. You are VERY creative. Love these blog hops, you meet the most creative and nicest people along the way. I'm a new follower. I LOVE this wonderful shaker card! Simple yet oh so cool! TFS! I am so in love with this fun dimensional shaker card! Off to put this plate on my wishlist!!! OMgosh how FUN!!! I'm loving this fabulous rainbow pinwheel shaker, SO cool!!! I see lots of shaker cards but this is the most creative one yet and I just adore it. :) Thank you so very much for sharing your wonderful talent. I find you very inspiring!!! The color wheel was great and then you see that it's a shaker card. Wow, what an amazing shaker card! I love the bright colors against the white background. Brilliant idea ! So beautifully and professionally done ! I liked the idea with the window - a wonderful card turned out! Great card! It's been so long since I've done a shaker card. So clever! Love this and its reference to color and the color wheel! The dimension is great! GREAT colours and FAB design!!! This card is just so fun to look at. I love the colors you used! What a fun card! I just love the colors and the design. I started following you on Bloglovin. Love these bright colors. The shaker is great. A really cute card, and lovely bright colours. 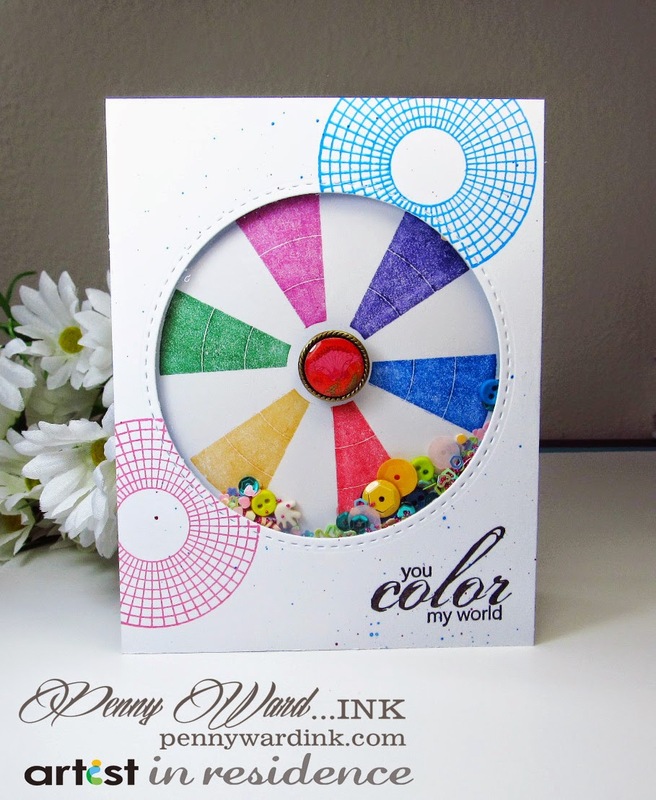 What a wonderful colourful pinwheel shaker card with step by step instructions!! How creative and fun. I love it. Thank you for sharing this is a super fun Idea! Fabulous and fun card! Thank you for the tutorial and will pin this too! Love the colorful and shaker aspect especially! !